Julie McElroy completed her Bronze Level of the National Navigation Award Scheme, (NNAS) earlier this month with her tutor and assessor, Robert Bell. NNAS (National Navigation Award Scheme) is concerned personal performance, non-competitive and allows participants to gain technical competence in navigation. Since May this year, Robert has spent time preparing Julie to complete the Bronze Level of the National Navigation Award Scheme. The National Navigation Award Scheme is a very rigorous in terms of practicality and this was a huge undertaking for Julie. Robert who lives in Edinburgh and is a qualified NNAS Course Provider and Assessor worked with Julie. He said, ‘Being Julie’s tutor and assessor was an interesting challenge from the start to end. The NNAS programme (assessment) is physically and mentally demanding and I had to bear this in mind when working with Julie. However after discussing with Julie what she wanted to achieve and what I could offer/do to help her achieve this, then a plan of action was agreed upon’. Julie who stacked up many accomplishments in the outdoor pursuits says ‘Completing Bronze Level of the National Navigation Award was tough. Due to my disability, I have to use walking sticks while out in the wilderness and my manual dexterity was the biggest of having to hold a map and compass was not easy as it seemed’. One of the components of completing the National Navigational Award is applying theory into practice. Robert took the challenge and opportunity to take Julie to walk a section of the Pentland Hills in Edinburgh. Robert acknowledged that this navigational component was hard for Julie. He went on to say ‘Julie’s challenge was her disability, being the sheer complexity of her walking gait and of course, her deafness. Julie can tire quite quickly due to the physical exertion on her body, this meant not only would it be physically demanding but mentally too. However, knowing of Julie’s previous achievements in the outdoor pursuits arena, I knew her determination to succeed would get her through’. It clear that Julie and Robert had to work in partnership and two words between them were trust and patience. Robert went onto say ‘I needed Julie to trust and believe that through me, she would gain the NNAS Bronze Navigation award. This I had to achieve from the start and then the assessment, the trust and patience grew from that. The completion of her latest outdoor award add to her growing list of outdoor accomplishments. Robert is delighted to have played a part in this next chapter with Julie who is moving onto a new phase in her life, he said ‘It means a lot, as, up until now, I had never worked with a person with a disability on the NNAS programme. From having worked with Julie it has given me a new insight into working with people with disabilities. Julie relishes another feat had been completed, Robert is too as when asked how more tutors could facilitate opportunities for people with disabilities to complete the National Navigation Award Scheme, he went on to say, ‘If I can convey any message then it would be this, have the confidence, manner, attitude, diligence and enthusiasm to make it enjoyable. Patience is what I would say, a big factor also and take into consideration the person with a disability needs, strengths and weaknesses. Most of all enjoy it, as the person with disability will. National Navigation Award Scheme – learn navigation skills and gain confidence to get out and enjoy the countryside. The Duke of Edinburgh’s Award (commonly abbreviated DofE), is an award given for completing a programme of activities that can be undertaken by anyone aged 14 to 24. DofE programmes take between 1 year and 4 years to complete, depending upon the route taken. All programmes must be completed by the participant’s 25th birthday. Around 275,000 participants are taking part in their DofE programme at any time in the United Kingdom. Glasgow hosted the IPC World Swimming Championship this year, (13 – 19 July). More than 580 swimmers from nearly 70 countries converged in Glasgow to compete over seven days of competition at the Tollcross International Swimming Centre. It the Para-Swimmer’s one of the biggest qualification opportunities ahead of the Rio 2016 Paralympic Games. This was another fantastic opportunity for Glasgow to showcase Para-Sports at the elite level as the one year anniversary of the Glasgow 2014 Commonwealth Games approaches. Having been involved in the Para-Sports build-up towards Glasgow 2014, two years prior to the Commonwealth Games, staging the IPC World Swimming Championships was a catalyst for Glasgow to strengthen it reputation. Glasgow also built on it formidable status as a host of international events, having hosted the 2013 Duel in the Pool and all six days of swimming at the Commonwealth Games. Glasgow 2014 had accessibility, equality and inclusion as a core part of the Commonwealth Games function in relation to the Organising Committee. Tollcross underwent a major refurbishment in the lead up to Glasgow 2014 entwined with the sustainability and accessibility vision too. Glasgow 2014 Commonwealth Games has left a legacy, the culture change, perceptions change and a sustainable legacy of inclusion and accessibility within society. The IPC 2015 World Championships we saw established Paralympians go head-to-head in some of the most compelling rivalries in para-sport. It was exhilarating, captivating and new talent blossom as the popularity of the Paralympics continues following the impressive rise of Para-Sport coverage since London 2012. I was incredibly fortunate to be a flag-bearer for Uzbekistan at the 2015 IPC World Swimming Championships’s Opening Ceremony. It was a pleasure to work closely with the IPC’s media team and the Media Operations manager. Over the last eight days, having been involved with the IPC’s Media hub in Glasgow, it brought me a new and another chapter of emergence of where I am going next! A record 1,253 young people will receive their Gold Duke of Edinburgh’s (DofE) Award this year over four ceremonies at the Palace of Holyroodhouse on the 2nd and 3rd of July. HRH The Duke of Edinburgh will be in attendance on Thursday, 2nd July and HRH The Earl of Wessex will be in attendance on Friday, 3rd July. Celebrities from the world of television, music, radio and sport will be joined by representatives from the Scottish Government to celebrate the achievements of these talented young people and present them with their Gold certificates. Presenters include Glasgow band Fatherson, comedian Des Clarke, Glasgow 2014 medallist Jennifer McIntosh and Acting Minister for Children and Young People Fiona McLeod MSP. The young people have gone the extra mile, committing themselves to bettering themselves and their communities to achieve their Gold. Many, like 18 year old Sara Salloum, from Aberdeen, worked for over a year with additional support needs groups as part of their Volunteering section. Sara said: “It was fantastic volunteering with the Saturday Fun Club at Hazelwood School for additional support needs children. As I volunteered at Hazlewood through Bronze and Gold DofE I built up a good relationship with some of the children I saw each week. They were all so sweet. It’s nice to just treat them like anyone else instead of branding them as their disability. Presenter Ms McLeod, Acting Minister for Children and Young People, said, “I am delighted to present the young people with their Gold Awards. The aspirations behind the Duke of Edinburgh’s Award programme fit well with key priorities for this Scottish Government, of participation, prosperity and fairness. Presenter and Disabilities campaigner Julie McElroy, who herself is a Gold Award holder, said: “These young people have demonstrated the resilience and tenacity to work hard to achieve their Award. They should be extremely proud of what they have achieved as I firmly believe that the Duke of Edinburgh’s Award will serve them well and will aid them onto their next aspiration in life .The Award is a catalyst for the young people and will help them on their career path. “Each DofE Award is a personal development programme and all of the young people here have met their own personal goals in order to be here. With more and more young people achieving a Gold Award each year, it is a real tribute to the dedication and determination of Scotland’s young people. Julie McElroy has been appointed as an intern with Scottish Institute for Enterprise (SIE) at the University of the West of Scotland, (UWS) for the academic session of 2015/2016. Julie will join Angela Castellano in the role, as SIE seeks to expand its services to more students across the university’s campuses. Julie is currently a final year PhD student based within the School of Computing and Engineering at the University of the West of Scotland, (UWS). Julie from Glasgow, was born both profoundly deaf and with Cerebral Palsy, which affects the messages sent between the brain and the muscles, which affects her movements and coordination. Angela is a second year undergraduate studying ‘Web and Mobile Development’ in the School of Computing and will be reprising her role having started with SIE in a voluntary Ambassador position last year before becoming an SIE intern in full. Julie and Angela will begin start their Scottish Institute for Enterprise (SIE) appointment in August 2015 for seven months, later this year and will be stationed across campuses. They will work closely with university staff and students across the University of the West of Scotland and in particular the Enterprise and Innovation Research Centre along with fulfilling responsibilities associated with SIE out-with the University. The Scottish Institute for Enterprise exists to help Scotland’s Higher Education students to develop an entrepreneurial mind-set and skill-set through encouragement and support structures designed to assist them in launching new for-profit and non-profit ventures. The SIE Intern Programme is one of the key ways this is achieved. Julie and Angela’s remit with the Scottish Institute of Enterprise (SIE) will be to complement the current activities of the SIE team – working closely to support initiatives which stimulate entrepreneurship within the student population at their institution. The key requirement will be to support SIE activities and initiatives, but also to support locally based projects, for the benefit of the University of the West of Scotland. The main goal of the SIE Intern is to use peer-to-peer communication to raise awareness of and engagement with entrepreneurship and enterprise through SIE and other programmes, events and services. SIE is funded by the Scottish Funding Council and Scottish Enterprise to help students in Scotland develop enterprise skills, discover their entrepreneurial talent and start up their own ventures. The University of the West of Scotland is a university operating from four campuses in south-western Scotland, in the towns of Paisley, Hamilton, Dumfries and Ayr. The present institution dates from August 2007, following the merger of the University of Paisley with Bell College, Hamilton. Julie McElroy is now back to take on a new personal challenge in the Outdoor circuit to complete her Bronze Level of the National Navigation Award Scheme, (NNAS). The opportunity for Julie to complete the Bronze Level of the National Navigation Award Scheme, (NNAS) was given to her by Robert Bell. Robert will become Julie’s tutor and assessor of the Bronze Level. Julie is delighted that Robert will lead her through the Bronze Level of the National Navigation Award Scheme, (NNAS). Julie says “It is crucial that you find someone who understand your needs. Given that I am profoundly deaf, Robert will be doing a dual roles for me. It is important that the one-to-one programme is delivered for me as there is so much to take on in the outdoor and it is vital that the information is disseminated correctly to me in this pursuit if I am to tackle more outdoor ventures in the future. When I first met Robert at the Scotland’s Duke of Edinburgh Award’s engagement earlier this year, Robert developed a good communication strategy with me so it clicked from there”. Robert lives in Edinburgh having previously served fifteen years in the Army (Argyll and Sutherland Highlanders). Since leaving, Robert has gone onto crave various careers and one them in the outdoor pursuits and is qualified in many areas of the outdoor with young people at the forefront of his fulfilment. He is a qualified National Navigation Awards Scheme (NNAS) course provider and assessor. Also a qualified Summer Mountain Leader registered with Mountain Training Association and accredited Duke of Edinburgh Expedition Assessor up to Gold level. He is also an adult instructor with the Army Cadet Force (ACF). Robert first became involved in the National Navigation Award Scheme (NNAS) from his father who was a course provider at the time. NNAS (National Navigation Award Scheme) registered providers offer training in skill development, and assessment to participants. The scheme is not in itself a leadership qualification. It concerns personal performance and is non-competitive. The various levels of the scheme lets everyone experience and demonstrate technical competence in navigation. Normally participants begin with the Bronze award and progress through the Silver and Gold awards, with a period of further experience and consolidation between. Julie and Robert met at the Scotland’s Duke of Edinburgh Award’s Expedfest weekend earlier this year where Julie was there as an invited guest, in the role as a DofE ambassador (Scotland). The weekend was specifically held for Duke of Edinburgh Award’s leaders and assessors. It was only recently that Robert and Julie met up to share Duke of Edinburgh Award’s experiences and Robert offered Julie the chance to complete the Bronze Level of the National Navigation Awards Scheme (NNAS). Speaking of the opportunity to work with Julie, Robert says “Julie has a deep desire to try new challenges as and when they arise. She pushes herself to achieve these challenges and in doing so, inspires others. She has shown me that she has the determination to succeed and wishes to learn a new skill”. Robert went to say “Julie is an amazing woman. 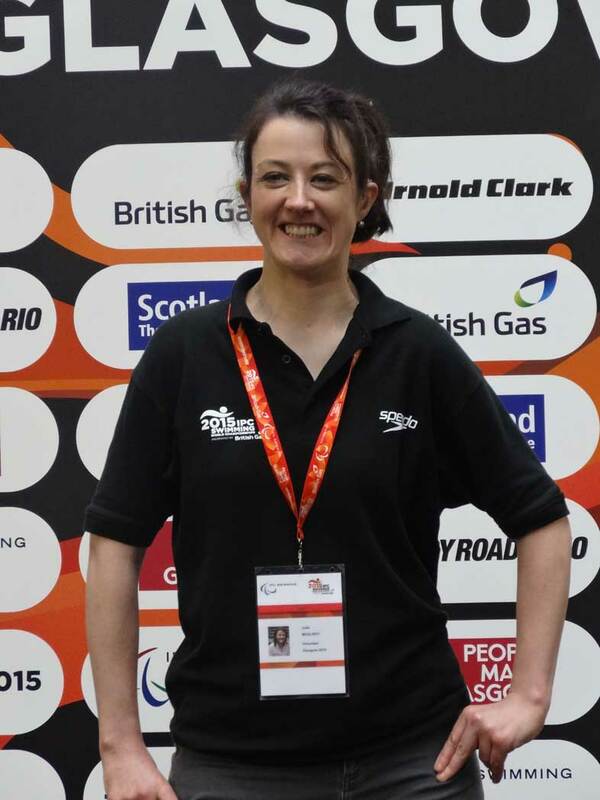 Over many years, Julie has put all her energy into completing new outdoor challenges and arena sports. From climbing Ben Nevis, to walking in the Andes. Julie is and inspiration to all, not just within the disabled community but within the able bodied community too”. Julie’s undertaking of the Bronze Level of the National Navigation Award Scheme, (NNAS) will be exceptional because of her personal circumstances and the adversity Julie has pushed in the outdoor pursuits in previous years. Julie from Glasgow, was born both profoundly deaf and with Cerebral Palsy, which affects the messages sent between the brain and the muscles, which affects her movements and coordination. Julie says “It a different challenge altogether as I have always wanted to do another award. Recently, I looked at outdoor qualifications but the prospect of doing some of these qualifications was challenging given changes in the complexity of my walking was hard to come by. When Robert suggested the possibility of doing the Bronze Level of the National Navigation Award Scheme, (NNAS), I realised it could be about to open new direction for me and it fantastic to have Robert help me unleash it”. Robert too is looking forward to the journey ahead as he says “Everyday Julie faces some challenge in one way or the other that is a fact of life for her. The National Navigation Award Scheme (NNAS) will be no different. However, I believe that she has the confidence, manner, attitude, diligence and enthusiasm to succeed”. National Navigation Award Scheme– learn navigation skills and gain confidence to get out and enjoy the countryside. Taylor Bowls recently kitted me out with new bowls as I am now able to play Bowls. A remarkable feat considering I only took up the sport since September last year. This bowling journey has been a rollercoaster as it requires full co-ordination, precision and concentration from me to allo w me to find a standing position where I can bowl. However, with the positive and corrective guidance from Jim my coach, I am beginning to enjoy playing a game of Bowls. The momentum has been great as I can now go alone and play with others without becoming reliant on a coach. Taylor Bowls has been extremely supportive in my quest to develop as a Para-Bowler. With the outdoor season about to get underway, it was important that I find the right type of Bowls. With the help of Anne Dunwoodie, a Scottish Internationalist who has witnessed my ParaSports journey since we first met three years ago advised that I try out Ace Bowls. I fell in love with Ace Bowls, they felt so different when playing with them indoor. Also in the last few months, I have invested in new Bowls shoes but the process wasn’t straightforward as due to my stamina, endurance and strong hyperextension knee associated with Cerebral Palsy. I now have to wear wedges in my shoes and the mechanism was to be applied in Bowling as it would help with my bowling delivery. I invested in the latest Henselite model as they were the only Bowls shoes that enabled me to wear my Ankle-Foot Orthosis otherwise known as a Splint. Standing on the mat is still proving to be problematic at times due to my poor core stability, however the physios are looking into it and hope to provide me with some answers in the next few months which will hopefully satisfy my Coach and I. The next challenge in this Para-Bowls journey will be moving to outdoor surface from April onwards. This will poised a real challenge as the Greens will be heavier. It will be another area for my Coach, Jim to get me bowling in outdoor conditions. I shall await the challenge ahead of me!